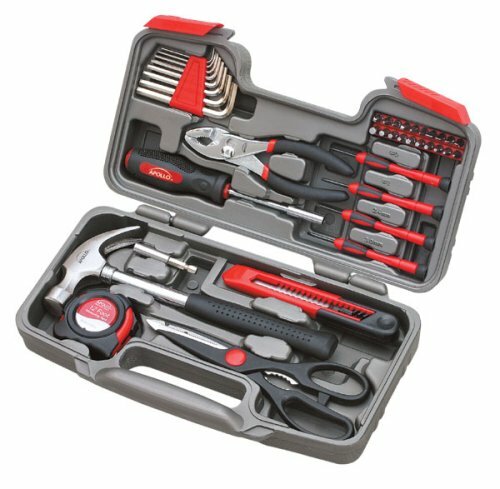 A general tool kit that contains basic tools needed for most repairs around the home. The tools are constructed of 45C carbon steel or chrome vanadium steel, heat treated, and chrome plated where appropriate to resist corrosion. The tool handles are made of double-dipped plastics and the tool cases are made of extra heavy duty materials. All tools meet or exceed critical ANSI standards. Each tool is tested against industry standards for hardness, torque, finish, and usability and should last a lifetime under normal use. The tools are held securely in a sturdy blow molded case. 8 SAE Hex Keys: 1/16"", 5/64"", 3/32"", 1/8"", 5/32"", 3/16"", 7/32"", 1/4""
Ten 1"" bits: T10, T15, T20, T25, T27, T30, 1/8"", 5/32"", 3/16"", 1/4""
If you have any questions about this product by Apollo Tools, contact us by completing and submitting the form below. If you are looking for a specif part number, please include it with your message.